API Smart API Add "real time" freight quotes & automated bookings to your site's checkout. 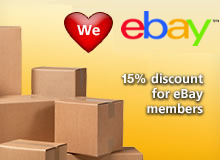 Shipping Calc Smart Shipping Calculator Add "real time" freight quotes to your webpage or eBay listings. More than 1 item to send? The 'Receipted Delivery' service ensures the delivery driver will ask the receiver to sign for the goods as delivered. If no-one is available to receive the goods, the driver will leave a card at the delivery address, asking the receiver to call the local transport depot to organise a re-delivery (or pickup from the depot if they prefer). There are no further 're-delivery charges' even if multiple re-deliveries are required. Transport Assurance is not included in this service. A truck with a hydraulic tray at the back door lowers to the ground to help load or unload the goods. A vehicle with two employees will be sent to load or unload the goods. Please note this is not a furniture type removal service, the staff will not deliver goods into a house and assemble. They are only to aide in the loading or unloading of the goods. A maximum of 10 minutes onsite is allowed for. 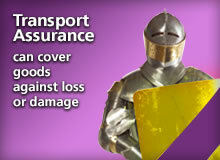 "Transport Assurance" can be added to your booking (via the Quick Quote section) and will provide Cover against loss or damage to goods in transit. A $100 Excess applies and is deducted when a claim is paid out. All goods must be suitably packaged for transport; insufficient packaging will void a claim. * Please also see our "FAQ" and "How do I Package or Describe my Goods" sections for advice on how to package goods correctly and other goods we will not transport. 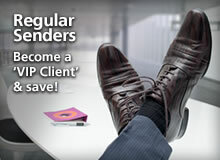 If you are still uncertain, email us at sales@smartsend.com.au. Claims will only be paid if goods are packaged appropriately and the Smart Send consignment-label is firmly stuck on the goods. Under-declaring the value of the goods: you must declare the full 'wholesale value' of the goods transported. If you declare a value that is less than the actual value of the goods and a claim is made by you, you will only receive an amount in proportion to the degree of under-insurance. For example: if the sum insured is only half the 'actual' value of the goods when a claim occurs, you would only receive approximately half the amount of the claim. Please note - you must be able to substantiate the value of the goods via an invoice or other documented proof of the value of the goods. A receiver signature on either a Proof of Delivery copy of the consignment-label, a sub-docket or an 'electronic signature' signifies the goods were delivered in full and not damaged in any way. If the goods are damaged the receiver must make a note stating this on the Proof of Delivery. If they have any doubts they MUST sign 'Pending Inspection' and cross out 'Accepting the goods in good order'. If a 'non-Receipted Delivery' service is chosen and goods are left at the delivery address by the delivery driver (due to a receiver being unavailable to sign for the goods), this will also deem the goods to be delivered in full and not damaged in any way. If loss occurs, you need to make a claim within 14 days of the incident occurring. If damage occurs, you need to make a claim within 48 hours of the incident occurring. If we do not receive a claim within these time periods, the Transport Assurance claim will be void. Email sales@smartsend.com.au with the subject line of the email as "Transport Assurance Claim: AOExxxxx" with the consignment number on the label sent at the time of booking. 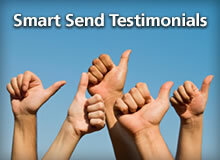 Include information on correspondence you have had with a Smart Send representative. If the goods were damaged, you need to include a minimum of two digital photos of the damage to the goods. One photo needs to show the goods and the damage sustained. The second photo needs to show how the goods were packaged (box and packaging material).The package material must be retained for inspection. More than two photos is preferable. You also need to attach a scanned image of the invoice (or other documented proof) substantiating the wholesale value of the goods. Failure to provide this information will result in the Tranport Assurance claim becoming void. Once approved, claims will generally be paid within 90 days of lodgement and funds will only be deposited into the Paypal account or credit/debit card used for the payment of our services. The "Transport Assurance" Conditions should be read in-conjunction with the standard Smart Send Terms & Conditions.